Update: The Series 30 Ronstan Orbit Blocks are now available on our website. Ronstan has “officially” released the Series 30 Orbit Blocks today; they’ve been advertised a little already and they were on the Ronstan website last week (maybe longer). Anyway, we’re working on getting them up on the site. There are a couple of unique blocks in the Series 30 line. They have a Dyneema linked pair of single 30mm blocks, which is a slick, lightweight alternative to linking together to blocks with clunky, metal shackles. The clew ring is also a nice piece, with a high strength stainless steel ring that is going to work on a number of smaller boats. Ronstan also released a Series 20 block with the Series 30 line. Yes, it’s technically its own series, but since there’s only one, it gets the middle child treatment. It’s a cool little block, capable of loads up to 250kg (550lb) while weighing a just 9 grams. 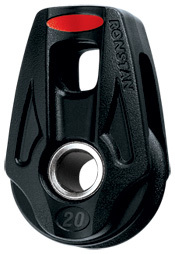 It has an integrated stainless grommet/hub to accept a lashing attachment, or it can be used as a through-sheave becket — it suits up to 4mm (5/32”) lashing. One note is that these blocks were engineered for easy fitting of a stainless shackle; it’s an advertising point for Ronstan. I’m still working to figure out if they actually include the shackle with the block; I don’t think so, but I’ll work on that. The Series 30 blocks are a solid options for most dinghies and small keelboats, and we expect that they’ll start making their way onto Lasers, 505’s, etc. in the near future. Ronstan looks to be targeting them at the sub-16′ boat market, but there are obviously going to be applications on boats in the small keelboat (Melges 20/24, J/22, J/24, etc.) range. Orbits are still being touted as the blocks with the highest strength to weight ratio, that are more compact than the competition — by the numbers, they’re right. The final test will come when they get into widespread use, but if they’re anything like the Series 70, Series 55 and Series 40 blocks, they should perform well and experience solid popularity.